The kids sneak out and do things behind their parents backs. The long-awaited sequel to The Candy Shop War! 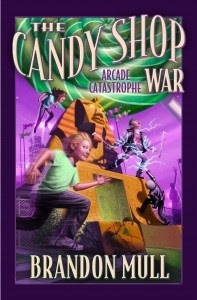 In The Candy Shop War, friends Nate, Summer, Trevor, and Pigeon met the evil magician Belinda White, whose magical confections enabled the kids to do incredible feats of strength and magic. In the sequel, Nate and his friends meet Mrs. White s brother Mr. White who owns Arcadeland, a local amusement center. At Arcadeland, kids can play games and earn thousands of tickets, which are redeemable for one of four kinds of stamps jets, tanks, subs, and racecars. Could it be true that these stamps allow kids to fly through the air? Or breathe underwater? Or run faster than a car? But Mr. White is hiding a secret: when all four clubs are filled, he will be able to retrieve perhaps the most powerful talisman ever. For Nate and his friends, it will take more than candy to fight and win this war!